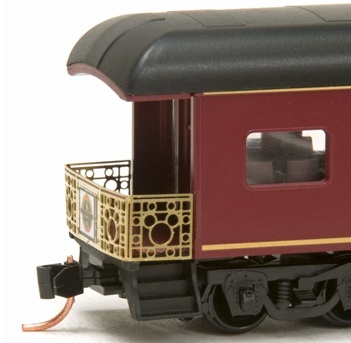 Carolwood Pacific’s “Kansas City” executive car. Complete with custom hidden Mickey railing. Sister car to the ‘Yensid Valley’ which sold out very quickly two years ago. This car was released today at the Kansas City N Scale Enthusiast, National N Scale Convention. A limited number are made available here, today, on the web site. This car follows a theme of cars named for locations that were significant to the man, Walt Disney. This is a factory produced special run by Micro-Trains.